Norbert Frei, Daniel Stahl and Annette Weinke (eds. ), Human Rights and Humanitarian Intervention. Legitimizing the Use of Force since the 1970s, Wallstein Verlag, Göttingen 2017. The Balkan Wars of the 1990s, the Rwandan genocide and the Darfur conflict served as catalysts for debates which significantly changed the character and institutional frameworks of international politics and international law after the end of the Cold War. Humanitarian emergencies and grave human rights violations came to range among the most powerful arguments to justify military interventions abroad. In the course of these debates international norms and principles as those of sovereignty and the prohibition of the use of force were renegotiated. This volume situates the history of post-Cold War humanitarian intervention within the larger history of the twentieth century by looking at political and cultural shifts that preceded the end of the bipolar world order. 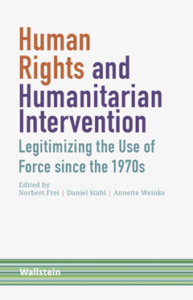 At the same time, it seeks to elucidate the specificities of interventionism during the 1990s – a moment when, for the first time, military interventions were being justified on the basis of the protection of human rights. The authors examine the role of a wide range of actors like governments, intergovernmental and non-governmental actors like NGOs, the media, and public intellectuals.